In a down economy, it’s important to support local businesses. The MLK Business Association recently launched a two week event called “Plate of Nations,” a special promotion where local restaurants come up with meal specials worth $8, $15, or $25. This gives people an excuse to sample restaurants that they might otherwise ignore. My sister is on the committee, so I got called in to do some of the photography for two places; The Original Philly’s (Left) and Karama (Right). 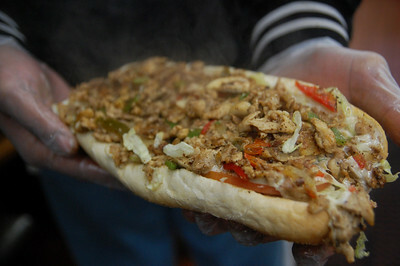 Philly’s serves up Cheese steaks, while Karama specializes in Somalian cuisine. Since it was snowing and I didn’t trust my tires that day, Sarah Valenta of Homesight was kind enough to give me a ride. We were on a schedule, so I decided to keep things simple by going all ambient. If you live in the Seattle area, then you should definitely check out the list of restaurants. A lot of the menus at these various restaurants can be intimidating for a first timer. 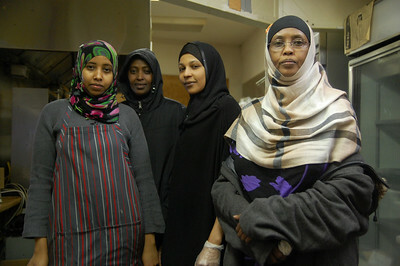 When you’re looking at a menu for a Somalian place for the first time, how do you know what to order? The great thing about these specials is the fact that these are the dishes that the owners have chosen in order to show off their cuisine. You don’t have to worry about ordering the right thing, or ordering the wrong thing. Just sit back and enjoy the ride.